You may be good at writing letters and emails but writing a Formal Memorandum Templates can sometimes be a difficulty. We need to think of the format it should be in so that it has that professional look and feel. If you are experiencing any trouble coming up with such a format you need not worry. 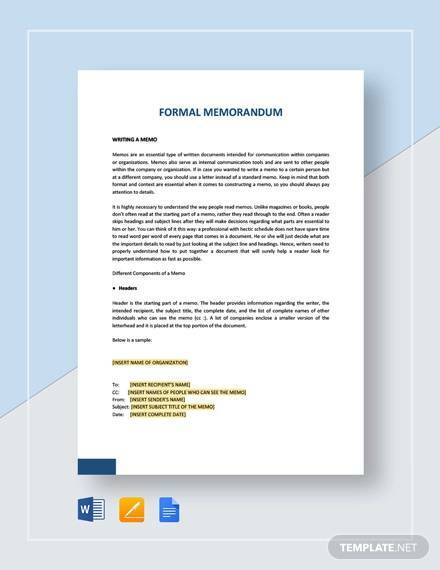 Download one of our many freely available formal memorandum templates to help you come up with a professional Memorandum of Agreement Templates. With already laid out format, these templates will guide you in writing one. Created in Word, these templates are also easily editable. This template consists of a written agreement between the applicant and two partners named herein, who are about to make application for an OVW (Office on Violence against Women) grant. 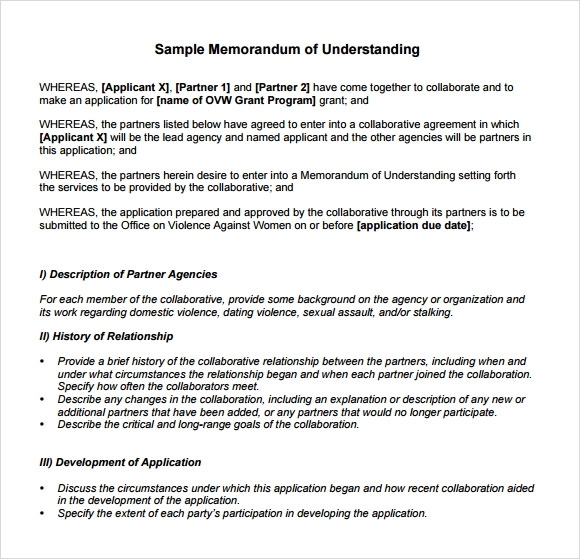 The memorandum describes the different agencies involved in this collaboration and throws a light on their relationships. The content of this template is related to legal issues. The headings in the memorandum should be in bold face and all texts should be written in black fonts. Under the heading “Questions Presented”, a short answer is to be written with single space between every line. 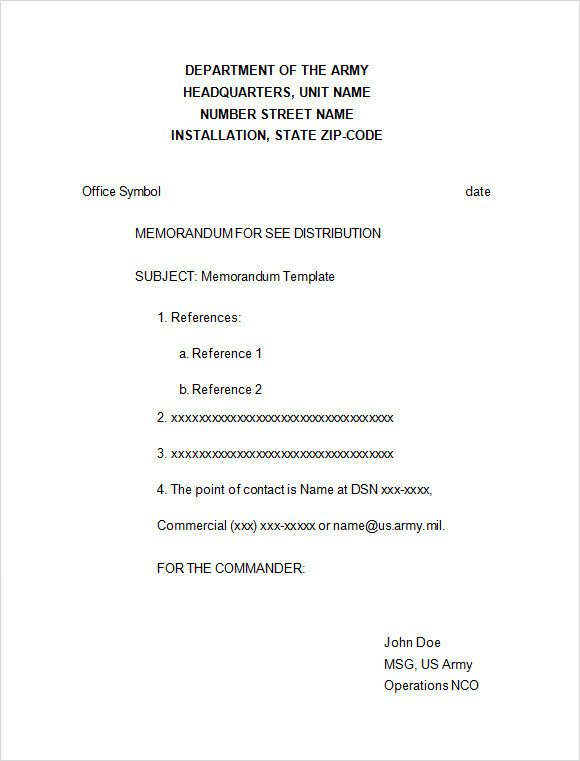 This template has the name of unit under the army headquarters department, at the top of the memorandum, written in legible black fonts in bold face, followed by the name of the state & its zip code. It is followed by other relevant information. This is a sample memo. It consist of the name of the recipient, say, the professor of an academic department followed by the sender, say, the head of that academic department and date, written in black fonts & bold face. Then there comes the message written in regular black fonts. 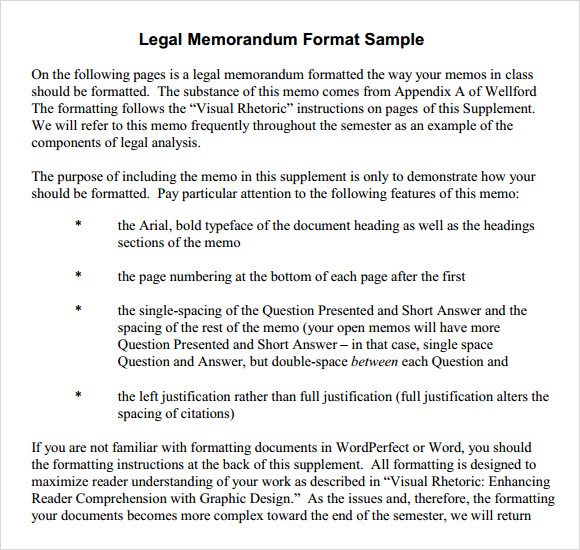 What Are Formal Memorandum Templates? Memos are quite different from letters. Memos are for sending messages in a crisp form, from one person to the other within an organization. One does not need to address the recipient respectfully using words like “Dear” or “Respected”. But one should mention the name of the recipient and the sender clearly in bold face. The texts are usually written on a white background. Black legible fonts are used in the texts. They can easily be edited using Microsoft Word. One should clearly mention the purpose of writing such a memo. The message should be divided in paragraphs for better understanding. 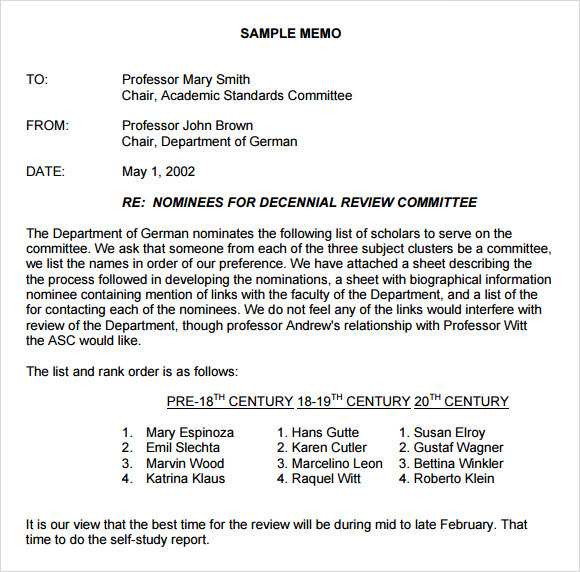 You may like Memorandum of Understanding Templates. The memorandum is to be written on white background. Black fonts in bold face are used generally, in writing the name of the recipient followed by the name of the organization and date on the left hand side of the page. Then the subject of the memo should be written in bold face on a separate line. On the next line, the message should be written in a concise manner, followed by a conclusion of few words in a separate paragraph. The entire content must be aligned to left margin. Then the name of the sender is to be written on the left hand side of the page. 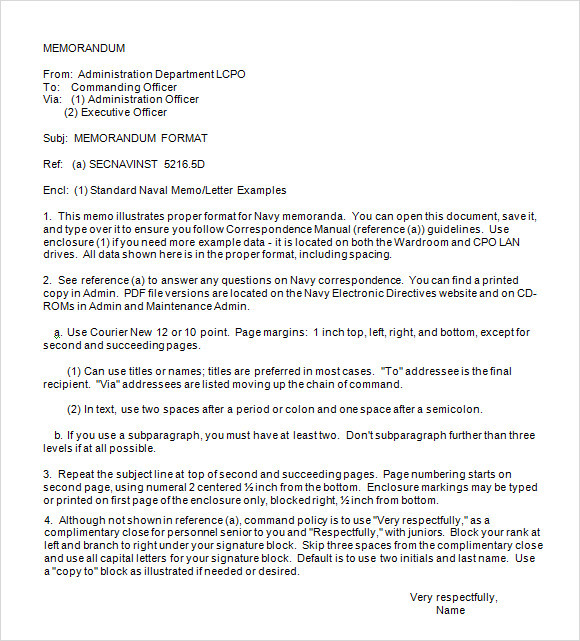 You can also like Private Placement Memorandum Templates. When Does A Formal Memorandum Template Come Into Use? When a few people working for an organization need to come to a mutual understanding, a formal memorandum comes into use. The memorandum must mention the name of the applicant along with the partners of the organization. It must mention their relationship and the reason for making an agreement together. A memorandum is also needed when addressing any legal issue to the higher authority members. Such a memorandum should contain a set of questions with their short answers, used for describing the issue clearly and what are the conclusions made about the issue. A memorandum helps people within an organization to communicate in a professional way. 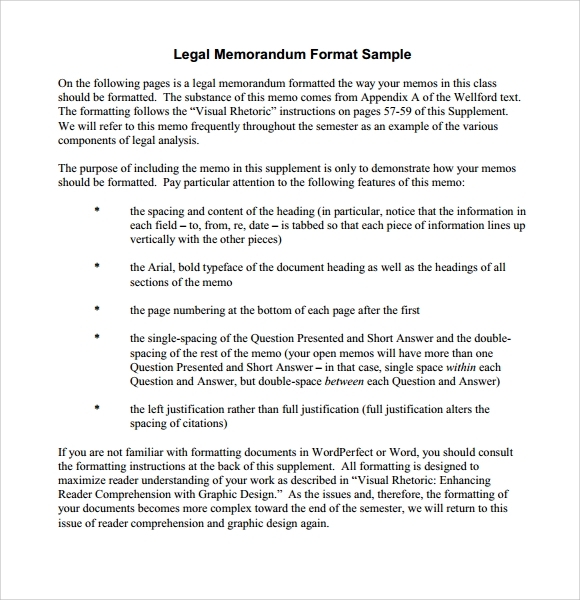 Formal memorandum templates must be written in such a way that one can easily comprehend the message after giving one quick reading. It must be written in a concise manner, in black fonts. The headings, if needed, must be written in bold face. The entire content has to be written on a white background.